Want a unique, one-of-a-kind engagement party gift? Then turn to Captured Wishes. Our special Your Engagement wish vessel sums up exactly what you're feeling. Can't put into words your happiness for the newly-engaged couple? Then we'll do it for you. This beautiful Captured Wish (height approx 30mm x 15mm width) is just the gift to sum up your feelings of joy and happiness for the newly-engaged couple. 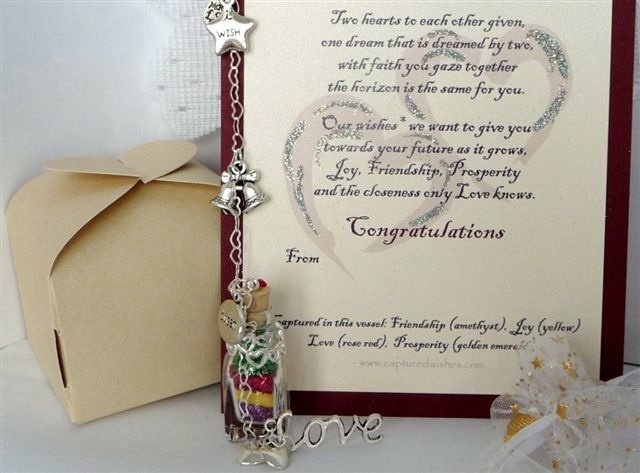 Each hand-crafted engagement wish is filled with the right color combinations of Fairy Dust to 'sprinkle magic' on the couple's life together. It makes the perfect engagement party gift idea -- you can be 100 percent certain that only YOU will be giving this gift to the couple!